It's still freezing AF outside, but I'm looking forward to layer-free, sunlit days AND am already curating the perfect wardrobe for Spring/Summer 2019. My fashion vibe remains similar to previous years, but my upcoming Nashville trip has inspired me to don free-flowing silhouttes, feminine prints and more color. AND, I've lost a lot of weight, so I'm inclined to show off this summer.. Neutral shades, a pop of amber, printed tops and casual handbags are on my must have list. I'm obsessed with Chloé sunglasses - it's an addiction! 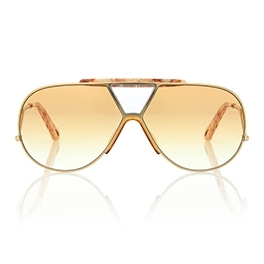 These Chloé Willis aviator sunglasses (available at MyTheresa) are amazing! The gold-tone frame, amber lense and pink marbling across the bridge and on the ear pieces are the perefct color combination. These glasses are slightly oversized - love that! I'm a huge fan of aviator sunglasses - the silhouette makes everyone look better. 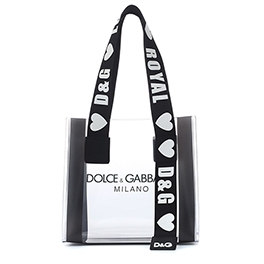 This Dolce & Gabbana Belezza black logo-print PVC tote (available at Farfetch) is super fun and perfect for summer. Transparent handbags are tricky - you gotta be mindul of what you put in there, but a cute cosmetic bag will personalize and elevate the "everything is on-display" look. This tote is also available in transparent-black, yellow, pink and blue. LOVE! AND WANT! The Haider Ackermann handwritten tank top (available at Farfetch) is perfect for layering and will create a cool juxtaposition against feminine silk pants (next on my list). 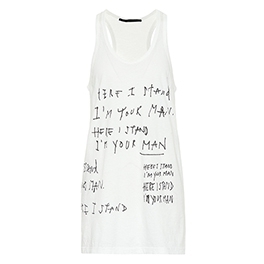 The Haider Ackermann brand has a few handwritten t-shirts, tanks and sweatshirts all doning different print, either in white with black print or black with white print. This unque style adds a little badass vibe, laid-back vibe to any look.. The Chloé Spring/Summer 2019 collection is everyting I love about fashion AND Chloé. The cool-girl vibe is feminine, chic and free-spirited. 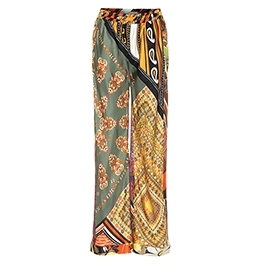 These bohemian-style Chloé wide-leg trousers (available at Farfetch) are gorgeous. The multi-colored, silk trousers are high-waisted and have an elastic waistband. These pants are perfect for summer AND will look great with the Chloé Willis aviators, D&G tote and Haider Ackermann printed tank top! It's the perfect wekeend look! 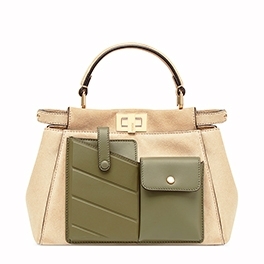 I LOVE this Fendi Peekaboo mini pocket suede handbag (available at Fendi). The Peekaboo style is one of my favorites and the reinvented bag with exterior multipurpose pockets is brilliant. The juxtaposition of the soft and luxurious suede and smooth, structured leather gives this bag a feminine, military vibe. The green leather against the sand suede with gold-finish metalware is the perfect color combination. This small handbag has two compartments inside, separated by a stiff partition. The Peekoboo style comes with a detachable crossbody strap - I like to accessorize my handbags with straps from the Fendi Strap You collection. Of course, I gifted this Peekaboo handbag to myself! 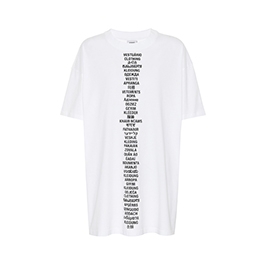 The word "Clothing" in many languages listed down the front of this Vetements t-shirt (available at MyTheresa) and up the back is intriguing. The super oversized cotton t-shirt makes a simple statement - clothing! Tucked in high-waisted trousers or worn loose over fitted pants with chic high-heeled booties, this t-shirt says "cool girl". I'm obsessed with these MIU MIU pink fur slip-on sandals (available at Farfetch). The printed cotton vamp dons white mohair giving these sandals a flirty, feminine vibe. I love the contemporary, feminine spirit of this brand AND have to have these sandals..
Another one of my favorites is Moschino. The brand is playful and synonymous with the bear print. The 3D-like "This Is Not A Moschino Toy" print against the pink t-shirt dress (available at Farfetch) is feminine, but with a little edge - a safety pin infected bear is kinda morbid! I love this shade of pink and am a huge fan of the ever-changing bear print. Moschino t-shirts and t-shirt dresses are high-quality. The cotton is medium weight and soft. I may or may not have a few! I'm a sneaker kinda girl and usually opt for basic white kicks, but I'll make a exception for these Moschino logo print sneakers (available at Farfetch) . 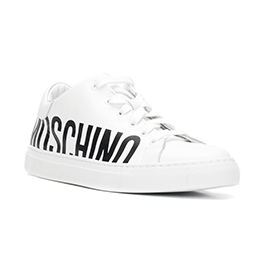 These basic white leather sneakers showcase the Moschino logo along the leather and white rubber sole. Moschino is one of the few brands that print the logo on the clothing and accessories that I will wear. I would pair these sneakers with chic sweatpants or a t-shirt dress. Maybe even with a super-feminine Zimmerman dress. One of my first brand obsessions - Jil Sander. I've since moved on, but this Jil Sander transparent shopper tote (available at Farfetch) has sparked my interest again. 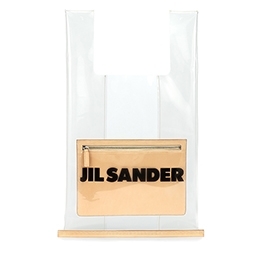 This grocery bag-like tote has a front zip pocket, with the Jil Sander logo. Transparent bags are tricky - you gotta be mindful of what you display in there. I suggest a neutral cosmetic bag to hold all of your handbag essentials. I gotta have this one.. I'm a HUGE fan of printed t-shirts and sweatshirts. Phrases, logos and graphics add a little something to my overwhelming amount of muted shades. My closet is lined with gray (lots of gray), shades of pink, green and beige, white, floral prints and I love camo. I'm a self-proclaimed sweatpants connoisseur and almost always opt for chic joggers and sneakers or pair them with high-heel sock-style boots. Even most of my wool and silk pants have an elastic waistband and cuffs! On top, it's a t-shirt, sweatshirt and knits. It sounds boring, but the prints add texture and amusement. 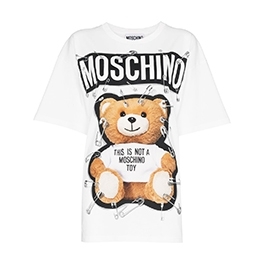 I'm obsessed with the "THIS IS NOT A MOSCHINO TOY" oversized Moschino t-shirt (available at Farfetch). It's fun and definitely noticeable. The Moschino bear is synonymous with the brand and often appears on limited edition Moschino apparel. This printed t-shirt is available in two styles - regular fit and oversized fit. I like the oversized fit, but had to size down. This season Moschino's "THIS IS NOT A MOSCHINO TOY" print shows the Teddy mascot surrounded by a string of fairy lights - LOVE! The bold Christmas themed graphic is the perfect print for a fun, holiday soiree. Admittedly, I went a little crazy on the Karl Lagerfeld site a few weeks ago and purchased a "few" t-shirts and sweatshirts. After the first purchase and feeling the quality, I had to have more..
Of the many graphics, I like the Karl and Choupette, Karl X Kaia and the Karl wearing black sequin sunglasses (available at Karl.com). The soft cotton Ikonik t-shirts are bright white and medium weight. The t-shirts are regular fit, but the sweatshirts run small. I purchased the pink Karl Ikonik sweatshirt and it's a bit cozy, but sold out, so I'm just gonna have to save that one for a skinny day. Printed cuffs on socks pair nicely with joggers and sock-style boots. 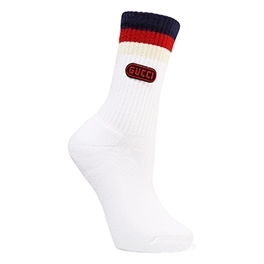 These Gucci appliquéd striped cotton-blend socks (available at NET-A-PORTER) are on my Christmas wish list. The navy, red and cream strips around the cuffs give these socks a retro, sporty vibe. If there were additional color schemes, they would be on my wish list too. I'm a fan of MSGM sweatshirts. The fit is nice and they're good quality. This MSGM brush strokes logo sweatshirt (available at Revolve) is super-soft on the inside and perfect for a cold day. The black screen print logo against the bright white cotton gives this sweatshirt serious contrast and will photograph nicely. I'm gonna pair this sweatshirt with Monrow camo sweatpants. The Fiorucci brand is new to my closet, but swiftly went from one to two.. The Fiorucci angels sweatshirt (available at Fiorucci.com) dons the iconic print paired with the Fiorucci name. I have this sweatshirt in two colors. The fit is perfect and the material is super-soft. The sweatshirt washes nicely and after many cycles through the wash, maintains the softness. I love this angels printed sweatshirt! I LOVE sweaters and boots. Summer is fun and I don't mind the barely-there outfits, but the heat is exhausting. I'm happy to invite Fall/Winter and the clothing, but will probably be complaining come March..
My list this month is one of my favorites - This Dolce & Gabbana "Fashion Devotion" t-shirt (available at FARFETCH) is the perfect accessory to a chunky sweater. Paired with jeans, chic joggers or a skirt, this first layer "says a lot"! Unfortunately, it's way outta the budget, so Imma take inspiration and shop elsewhere. I have been coveting the Chloé Rylee Ankle Boot(available at FARFETCH) since the Fall/Winter 2018 show. The rubber sole and heal are perfect for snow and the military vibe pairs perfectly with cozy sweatpants. YES, I'm obsessed with chic joggers. These boots come in two styles - the ankle boot and medium (up to your calf) boot. LOVE! 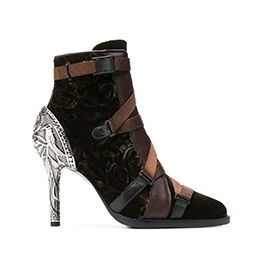 Another Chloé design - the Velvet Stiletto Ankle Boot(available at FARFETCH) is GORGEOUS! These boots are sophisticated and sheer perfection. The metallic heal, velvet design and crisscross straps the perfect juxtaposition - feminine and masculine. When I saw these Fendi Fur Slides(available at Mytheresa), my heart skipped beat. I know, you may hate me for loving fur, but to each his own. These super-cozy, fur slides are everything I want in a sandal. The pink and brown logo detailed fur is soft and the sole provides ample cushion. I purchased this style fur slide in a different embellishment/color scheme a few seasons ago and still love them. YES, I deserve these and I bought them for myself! I'm a Tibi fan. This brand is chic, simple, but a little different. 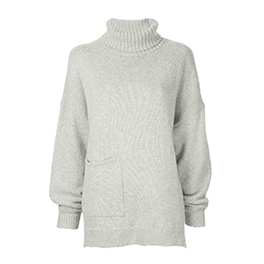 This Tibi Cashmere V-neck Patch Pocket Oversized Pullover (available at Tibi and FARFETCH) looks so cozy. Trust me, I know Tibi - the clothing is high-quality and the knits are super comfy. I would wear this sweater over and over.. 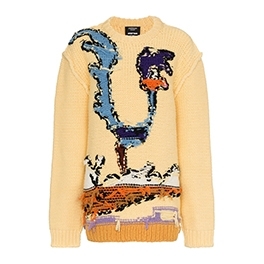 I'm not a yellow fan, but am loving this Calvin Klien Roadrunner Intarsia Reversed Seam Virgin Wool Jumper (available at FARFETCH). The Looney Tunes throwback is too fun! Pair this fun fashion sweater with chic bottoms for date night, a party or casual Friday. I'm obsessed with Fendi Rockoko boots and impatiently wait each season for the new color schemes and unique embellished styles. 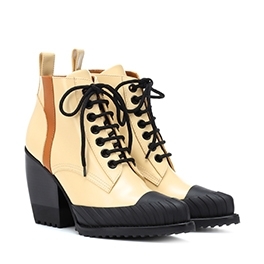 There's never a season that I don't fall in in love with another pair of Rockcoco boots (or two). This sock-style boot pairs perfectly with chic joggers (my favorite) and elongates your legs with skirts and dresses. They're surprisingly comfortable and of course, high-quality. This season, I have two pairs on my wish list, but if I have to choose, imma opt for the logo lace-up style. The signature FF motif detail and contrasting stripe along the collar give these boots a sporty vibe. I'll don these navy blue boots with stylish navy, grey and Burgundy joggers. This color scheme is available in navy blue with a red stripe or black. This color scheme and design is also available in the FF knit sneaker style. Both styles are available at Farfetch. 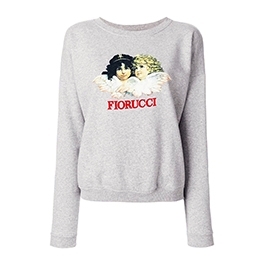 I recently discovered Fiorucci and love the angels print on the t-shirts and sweaters. 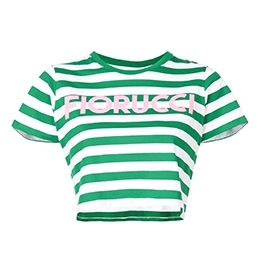 I'm not a crop top kinda girl, but this Fiorucci green and white striped cropped t-shirt paired with the somewhat high-wasited Fiorucci black joggers is really flattering and fun (available at Intermix and revolveclothinng.com). 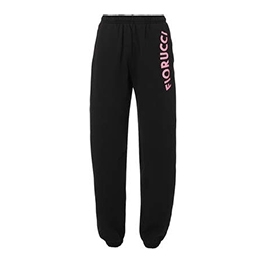 Both don the Fiorucci name in pink (I love anything pink). I never wear black, but this styling (seen on revolveclothing.com) is sporty and cute - the perfect loungin' around outfit. Another one of my favorite brands is Mother. The casual brand is predominantly denim and trust me, Mother jeans are amazing. The fit is perfect and for 'older' women, the high-waist style is really flattering. 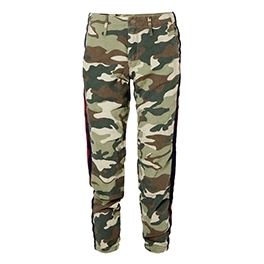 These Mother no zip misfit pants are the perfect combination of camo and stripes (kinda my thing this fall/winter). You can barely see that there are stripes in this photo, but there is a blue, red and blue stripe along the sides. The pants are medium-weight and soft. There is a zip fly with button closure and elastic leg opening - love the jogger style. The fit is nice (size-up) and the color scheme is perfection. YES, I have a pair and waited for months to get them (pre-ordered). These pants are available at motherdenim.com and revolveclothing.com. These Fendi ColibrÌ slingback pumps are gorgeous (available at Farfetch). The houndstooth pattern on the toe cap and checkered pattern on the toe, along with the Fendi hearts embroidered detail on the slingback strap and silver-tone heal are the perfect juxtaposition. There is also a pad on the slingback strap and hiking hardware, giving these high-fashion slingback pumps and sporty vibe. There is so much going on with this design and I LOVE IT! AND, the other Fendi Rockoko boots on my list (available at mytheresa and Fendi) - these boots don the stitched Fendi name and crystal-embellished hearts. The contrasting cream hue and black and will look great with just about anything you wear this fall/winter and especially elevate your party look. I've been drooling over these boots for weeks. I'm a little obsessed with Gucci these days. I can't afford any of it, BUT a girl can dream.. This Gucci oversized cotton t-shirt is perfect (available at Mytheresa). There is an adorable fawn print on the front and a floral print with a lady bug on the back. 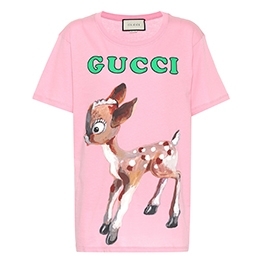 The green Gucci lettering is a nice contrast from the pink. This oversized t-shirt would look great with blue jeans and strappy, high-heel sandals. 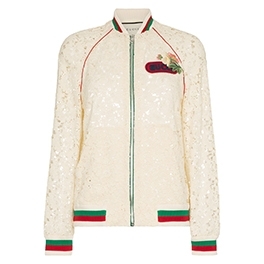 Gucci's leaf-brocade lace bomber jacket (available in major department stores and Farfetch) is feminine and sporty. The striped hem, cuffs, baseball collar and chest patch say "I'm a cool girl" and the delicate lace is pretty and refined. Along side the Gucci lettering, the floral, embroidered appliqué chest patch is consistent with the collection. I like the red piping along the shoulder line and green piping down the zipper. The green, white and red stripes and red and green piping represent the Italian flag . There's a lot of detail in this design - LOVE! There are matching flower-lace jogging pants with red and green piping and striped cuffs - SO Erika Girardi. 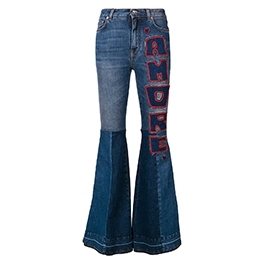 I'm coveting these Dolce & Gabbana Amore flared jeans (available at Farfetch). I haven't worn flares in years, but love that the trend may be on the way back in. The three shades of blue denim and denim patches with red stitching give these jeans a fun, loving, 70's vibe. I was just in Nashville and had an amazing time. I had hoped to get cowboy boots, but didn't get a chance to go shopping - probably for the best! 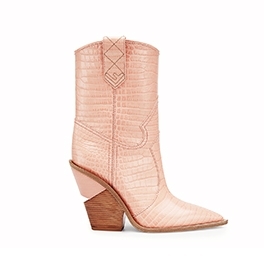 When I saw these Fendi pink crocodile-embossed ankle boots (available at Fendi), I was happy that I missed out on the cowboy boots in Nashville. This cowboy bootie design is gorgeous. I'm obsessed with pale pink shades and this color is perfect. The low boot leg is nice, cause I'm short and the heel is the perfect height. I NEED THESE BOOTS.. I just learned that Gucci has a décor collection and I want everything! The collection is fun, glamorous and way outta my budget. There's candles, dishes, folding tables, gorgeous chairs, panel screens and cushions. 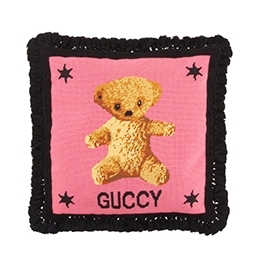 I have a Toy Poodle named Teddy Bear, so of course I'm coveting this Gucci embroidered needlepoint teddy bear cushion (available at Gucci) - SO CUTE! The misspelt 'Guccy' lettering references hashtags on social media. AND it's pink (well, on one side). This Gucci décor collection is inspiring me. Yup, another Gucci design on my 'must-have' list. 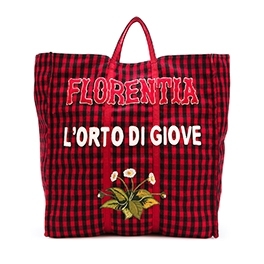 This Gucci Florentia tote bag (available at Farfetch) is perfect for fall/winter travels. The red and black gingham pattern reminds me of the classic hunters flannel shirt. This is labeled a mens tote, but anyone can don this oversized, wool bag. Like many designs in this collection, there's a floral appliqué. The Florentia L'orta Di Giove slogan references Florence and part of the Boboli Gardens of Palazzo Pitti.